A new University of Missouri study, as reported in the Hispanic PR Blog, shows that Mexican-American students who identify and practice speaking their native language have higher grades than those who are put in English-only environments in their schools. Mexican-American students who spoke in their native languages had higher grade point averages. Aguayo compared survey results of 408 Mexican-American students. He examined whether the students were born in the U.S. or Mexico; the students’ grade point averages; and the students’ abilities to perform college-related tasks. He found that students who embraced their cultural heritage and spoke in their native languages had higher grade point averages than those that only spoke English while in school and at home. In the future, Aguayo will study the motivations of Mexican-American students who move to the U.S. Statistics show these students have more success in school than Mexican-American students who have lived in the U.S. their entire lives. Source: University of Missouri, “Culture Predicts Mexican-Americans’ College Self-Efficacy and College Performance,” September 22, 2011. I LOVE this story!! However I believe something is missing here. 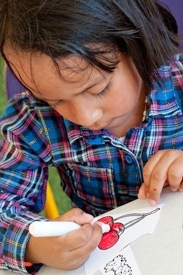 Research has shown that all children benefit from bilingual education no matter their backgound. I agree that there is a dual benefit here. I will first mention I have not read this study yet and maybe the researcher looked at the ability of the parents to better help their children at home and communicate with the instructors as well. There are so many advanatages to children learning mulitiple languages no matter what language is studied or their background. My Children are in a bilingual Spanish charter school. 90% of their instruction is in Spanish and has been since preschool. What should be known is that test scores suffer for the first 4 years, however, from 4th grade on the scores are higher than average. Understand this is because the children are educated in Spanish then tested in English due to federal testing regulations. My children live in an English only home in a multilingual neighborhood. I think the greatest advantage of having a bilingual education is that they do not have a fear of cross cultural communication and have a curiosity of other languages. Plus, we live in California it is extremely important for them to understand other languages and cultures.